On Monday, May 22nd, 2017, the Frederick Compost Workgroup hosted the Frederick Compost Summit at Fox Haven Educational Farm. ILSR’s Composting for Community project co-sponsored the summit along with Frederick Zero Waste Alliance, Fox Haven Farm, and others. Cindy Johnson, Director of Recycling for the Frederick County Solid Waste Management Division. County Executive Jan Gardner identifies 3 key waste reduction options requiring more detailed analysis. 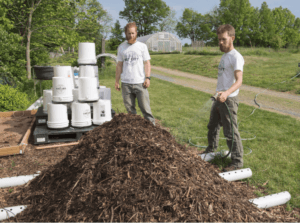 Community-scale decentralized composting is one! Farmers were also well represented on the event’s panels by Jeremy Criss, Manager of the Montgomery County Agricultural Services Division, and Keith Ohlinger, farmer and composter at Heritage Hill Farm in Howard County. 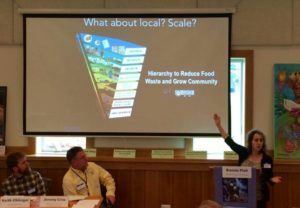 The summit brought together 97 local regulators, farmers, stakeholders and citizens to discuss existing challenges, such as zoning and unclear county regulations, which hamper the ability of the county’s large number of farmers to compost. The summit provided valuable information-sharing and an opportunity for county residents to ask questions of local regulators, while also fostering new collaborations, and identifying concrete next steps and volunteers willing to help carry them out. ILSR looks forward to continuing to support the Frederick Compost Workgroup’s advocacy as both advisers and friends. ILSR’s Linda Bilsens kicks off the Summit with her remarks highlighting the connection between compost and healthy soil. 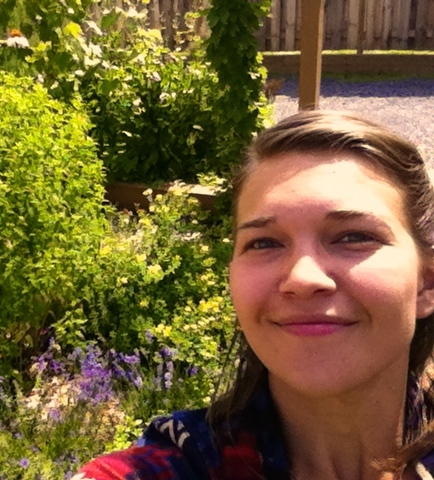 Two graduates of our 2015 Neighborhood Soil Rebuilders (NSR) training course, Lacey Walker and Phil Wescott, show the power of a train-the-trainer program to spread enthusiasm for composting. 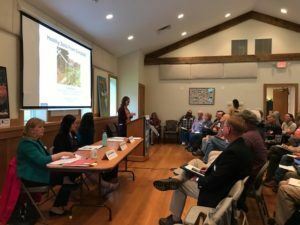 After completing the course, they took their knowledge back to Frederick County, and organized the Frederick Composting Workgroup to engage both local government and the community. 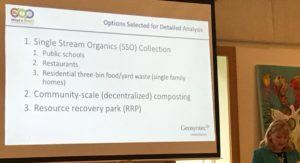 In part due to this workgroup’s advocacy, the county has now identified source separated organics collection and decentralized community-scale composting as 2 of 3 priority waste management options requiring more detailed analysis. This plan could involve as many as 15 different smaller scale (10,000 yards per year produced) sites. The hope is that many would be located on farms. Because of farmers’ intimate knowledge of soil, they are perhaps the most appropriate stewards of the composting process. ILSR’s Brenda Platt emphasized the need for a distributed and diverse infrastructure, with scale and local being important considerations. In addition to becoming a local compost expert and advocate, Phil started Key City Compost, becoming the first service provider in the county to offer curbside collection of food scraps for composting which are then composted at a local farm. At the summit, Phil shared his hopes for Key City Compost’s future expansion. We are hopeful that the interactions at the summit will help to facilitate the path forward for Key City Compost, as well as other local composting entrepreneurs. “I would love to see Frederick County formally allow the on-farm composting of organics that mimics the state’s 5,000-square-foot exemption. 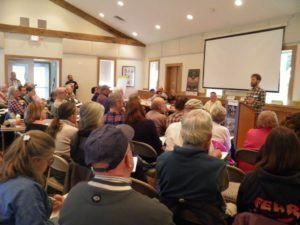 That would make it a lot easier for someone like myself to graduate into a larger program.” NSR grad Phil Westcott advocated during the Frederick Compost Summit. ILSR and Fox Haven Learning Center are currently fundraising to host an NSR training to build leadership capacity for rural composting. Part of the plan is to develop an on-farm composting demonstration and education site, that can spawn other on-farm initiatives. Fox Haven is an education center, ecological retreat, organic farm and wildlife sanctuary. The 700+ acre property is primarily dedicated to reforesting and rewilding the lands that support the Catoctin and Potomac Watershed. As an education center, they welcome rural farmers, homesteaders, school groups, citizens, and others to reconnect with the land and learn about the importance of maintaining soil and water health. Fox Haven is a member of the Farm Bureau as well as the Jefferson Ruritan. Their proximity to Frederick gives Jefferson a mix of multi-generation farmers and Jefferson business owners as well as relative newcomers to the rural setting who are departing from nearby cities.